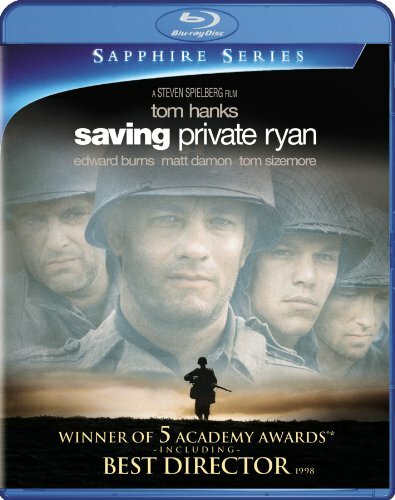 Steven Spielberg directed this powerful, realistic re-creation of WWII's D-day invasion and the immediate aftermath. The story opens with a prologue in which a veteran brings his family to the American cemetery at Normandy, and a flashback then joins Capt. John Miller (Tom Hanks) and GIs in a landing craft making the June 6, 1944, approach to Omaha Beach to face devastating German artillery fire. This mass slaughter of American soldiers is depicted in a compelling, unforgettable 24-minute sequence. Miller's men slowly move forward to finally take a concrete pillbox. On the beach littered with bodies is one with the name "Ryan" stenciled on his backpack. Army Chief of Staff Gen. George C. Marshall (Harve Presnell), learning that three Ryan brothers from the same family have all been killed in a single week, requests that the surviving brother, Pvt. James Ryan (Matt Damon), be located and brought back to the United States. Capt. Miller gets the assignment, and he chooses a translator, Cpl. Upham (Jeremy Davis), skilled in language but not in combat, to join his squad of right-hand man Sgt. Horvath (Tom Sizemore), plus privates Mellish (Adam Goldberg), Medic Wade (Giovanni Ribisi), cynical Reiben (Edward Burns) from Brooklyn, Italian-American Caparzo (Vin Diesel), and religious Southerner Jackson (Barry Pepper), an ace sharpshooter who calls on the Lord while taking aim. Having previously experienced action in Italy and North Africa, the close-knit squad sets out through areas still thick with Nazis. After they lose one man in a skirmish at a bombed village, some in the group begin to question the logic of losing more lives to save a single soldier. The film's historical consultant is Stephen E. Ambrose, and the incident is based on a true occurrence in Ambrose's 1994 bestseller D-Day: June 6, 1944.